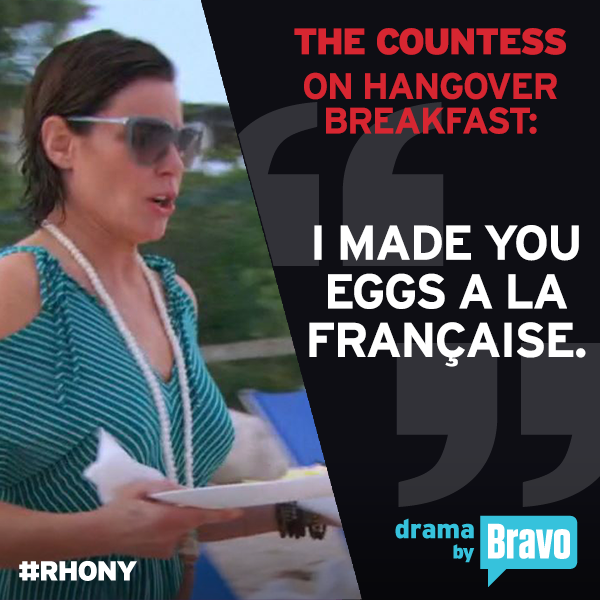 iRealHousewives | The 411 On American + International Real Housewives: Luann de Lesseps’ ‘Eggs à la Francaise’ Recipe! Luann de Lesseps’ ‘Eggs à la Francaise’ Recipe! From now on we will be sharing food recipes from your favorite Real Housewives stars on a weekly basis, so everyone can enjoy these delicious dishes, mixed drinks and much more. This week we will be sharing Luann de Lesseps infamous Eggs à la Francaise. Check it out below! If you recall, the meal first made an appearance back in Season 7 of The Real Housewives of New York City as Luann tried to cool down a very hot Sonja Morgan during the ladies' trip to Turks and Caicos. Last month, the mother-of-two shared with her fans how the make the infamous meal via her social media. Luann mixed eggs in a bowl as you would normally do to prep scrambled eggs and added salt, pepper, and a drop of water before putting them into a pot, not a pan. "The key to good eggs à la Francaise is you have to constantly stir them and with a pot with some butter so that they're really fluffy," Luann said in one video. "That's why they're called eggs à la Francaise; they're not from the frying pan. They're like mashed potatoes." Luann also took to her Bravo blog to share the recipe with her fans. Check it out below! Directions: Whisk eggs with the milk, salt, and pepper. Melt the butter in a saucepan, add eggs and cook on low heat, stirring continuously so the texture is very fine and creamy. The consistency should resemble polenta. You can add a dash of truffle oil or a spoonful of tomato sauce to give it a new twist. Serves four. What other receipies would you like for us to share? Sound off in the comment section below!